Difference between revisions of "Johnny Klem"
John Clem. Library of Congress description: "Sgt. John Clem, U.S.A.". John Lincoln Clem ( August 13, 1851 – May 13, 1937), was a United States Army general who had served as a boy in the Union Army in the American Civil War. He gained fame for his bravery on the battlefield, becoming the youngest non-commissioned officer in Army history. He retired from the Army in 1916, having attained the rank of major general, as the last veteran of the Civil War still on duty in the Armed Forces. Johnny Clem was a soldier in the service of the United States for most of his life. He was born on August 13, 1851, in Newark, Ohio. His actual name was John Joseph Klem. Although Clem was only ten years old when the American Civil War began, he immediately tried to enlist in the Union army. He left his school classes to drill with the Third Ohio Volunteer Infantry Regiment. However, the Third Ohio, and many other units that passed through Newark, always rejected Clem because of his young age. Some accounts claim that Clem first had been permitted to join the Twenty-Fourth Ohio Volunteer Infantry. Other sources claim that Clem joined the Twenty-Second Michigan Infantry Regiment when it marched through Newark. Since Johnny Clem was too young to join the army officially, officers of the Twenty-Second Michigan contributed money to pay him a monthly wage. Soldiers provided him with a gun and uniform and trained him to be a drummer boy. Clem was finally allowed to enlist in the United States Army in May 1863, when he was only twelve. In the meantime, Clem had already participated in numerous battles and had become quite famous. According to most sources, at the Battle of Shiloh, Clem demonstrated his calmness under fire. A Confederate cannonball supposedly smashed Clem's drum while the boy was playing it. His reputation grew even more with his exploits at the Battle of Chickamauga. Confederate forces drove General William Rosecrans' Army of the Cumberland from the field. During the retreat, a Confederate colonel ordered Clem to surrender. Rather than give up, Clem raised his rifle and killed the colonel. Clem was captured later in the battle, but he managed to escape. Union journalists reported Clem's adventures to their readers. The drummer boy became an instant celebrity and earned nicknames like "Johnny Shiloh" and the "Drummer Boy of Chickamauga". For his bravery at Chickamauga, Clem was promoted to the rank of lance corporal. He changed his name to John Lincoln Clem and remained in the army until September 19, 1864, when he was discharged. Controversy currently rages over Clem's wartime experiences. There is no doubt that Clem was present at Chickamauga, but historians increasingly question his purported exploits at Shiloh. Skeptics accurately argue that the Twenty-Second Michigan did not officially form until well after the Battle of Shiloh, so there is no way that Clem could have participated in the battle at least with this regiment. There is always the possibility that Clem served with another unit at that time, but if this is so, it has been lost to history. Some scholars now contend that Union reporters enhanced Clem's exploits to help promote the war effort. 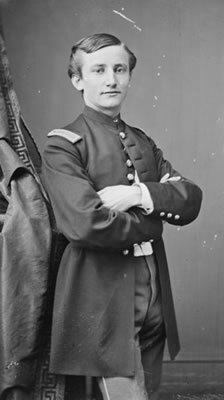 Following the Civil War, President Ulysses S. Grant nominated Clem to become a student at the United States Military Academy at West Point. However, Clem repeatedly failed to pass the entrance exam. In 1871, Grant overlooked Clem's failures and appointed him a second lieutenant in the United States Army. Clem remained in the army until 1915, when he retired. He was the last Civil War veteran to leave the United States military. He had risen to the rank of brigadier-general. Clem eventually settled in San Antonio, Texas, where he died on May 13, 1937.